PhD in Agricultural Economics, China Agricultural University. 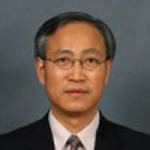 Director-General, Agricultural Trade Promotion Center under the Ministry of Agriculture of China. Former: Division Director, International Cooperation Department under the Ministry of Agriculture of China; Second Secretary of Permanent Representation of China to the United Nations Food and Agriculture Organization (FAO).